1978.027.001. 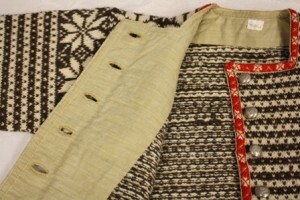 Fana Sweater: Purchased in Norway in 1951. 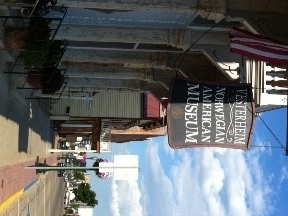 Image used by permission: Vesterheim Norwegian-American Museum, Decorah, Iowa. 1978,027.001. Inside of the Fana Sweater. Image used by permission: Vesterheim Norwegian-American Museum, Decorah, Iowa. Often, the most important information we can gather from a knitted artifact is on the inside, or what a knitter would call the wrong side. 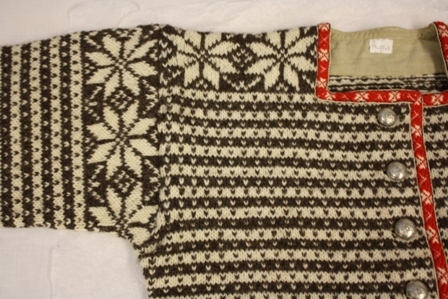 This Fana Sweater (a style of sweater that is identified with Fana, Norway) has sleeves that are knit from the shoulder down. The longer stranded floats of yarn from the two-color knitted pattern are woven in, and the buttonholes have been carefully sewn by hand. 1980.003.027: Indigo gloves with embroidery. Image used by permission: Vesterheim Norwegian-American Museum, Decorah, Iowa. 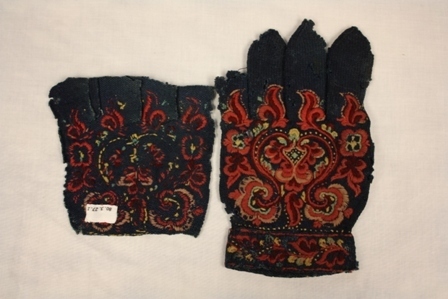 This glove and glove fragment were very densely knit in wool and then fulled, before being embroidered. The pattern is a beautiful rosemal design. While at the museum, I was also able to see some of the trunks that the immigrants brought from Norway, many of which are also painted in a rosemal design. The Vesterheim has some of the trunks featured in its online collection database. If only there were a few more hours in a day so I could learn more about embroidery, too! Alas. The main museum also has a nice textile display and spinning wheels in nearly every room. The Fladager Library at the museum has an amazing collection of out of print knitting and weaving books in both English and Norwegian. Definately worth a trip! Norwegian American Women: Migration, Communities, and Identities. Edited by Betty A. Bergland and Lori Ann Lahlum.